Sun Valley Co. is moving full speed ahead in its yearly race to start the ski season on Thanksgiving Day. Sun Valley Co. Director of Mountain Operations Peter Stearns said Thursday that the resort benefited from “a bit of a head start” this year. He said recent cold temperatures have allowed Sun Valley to start making snow earlier than usual and that the natural snowfall over the past few days has helped as well. “About 8 inches of snow has accumulated at the top of Baldy as of Thursday morning,” he said. He said the resort is on schedule to open as planned on Nov. 22, despite an upcoming warming trend predicted to hit the valley this week. Stearns said the worst thing that could happen weather-wise at this point would be if the upcoming warm spell lasts too long. According to Stearns, it must be under 26 degrees “wet-bulb” (which takes humidity into account—the lower the better) in order to make snow. Stearns said his team has been running the guns on Baldy for snowmaking purposes since Oct. 22, though the first test run occurred Oct. 16. He said if temperatures rise too much above 45, the resort might lose some ground. “It’s going to melt a little bit, but as long as it doesn’t stay too hot for too long, we shouldn’t be going backwards too much,” he said. He said the snowmaking team’s focus is on the runs that will open first. Those include Upper College, Flying Squirrel, 42nd Street, Roundhouse Lane, Mid River Run, Lower River Run, Lower Picabo and Lower Warm Springs. He said this “priority terrain” will provide about 120 acres of skiing on opening day. 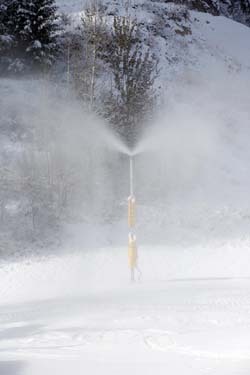 Sun Valley Co. spokesman Jack Sibbach said the resort will offer a few new goodies this season. One of those trails will be between Cold Springs Cut Off and Inhibition, just below the Roundhouse on the River Run side. The other will be between Christin’s Silver and Leigh Lane on Seattle Ridge.